Yesterday, Doha International Airport (DOH) reported it handled 505,581 tonnes of cargo in the first three months of 2019, a 1.7% decline compared to the same period the year prior, according to data published by the Arab Air Carrier’s Organization (AACO). February cargo throughput results for the world’s airports are still being finalized, but early analysis indicates year-over-year drops in cargo volumes in Europe and Asia, while American airports are close to flat with February 2018 traffic. Almost all airports worldwide posted year-over-year declines in volume for February and declines or very modest growth overall for 2019. Following two crashes of Boeing’s 737 MAX 8 within five months of one another, the aircraft has been grounded globally. 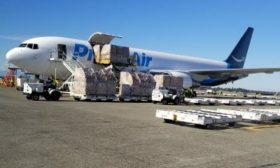 While the development is bad optics for Boeing, as carriers race to replace grounded aircraft, the impact on cargo capacity is varied and could temporarily boost available capacity on some routes. Southwest Cargo: We’ve got Ship to Do!